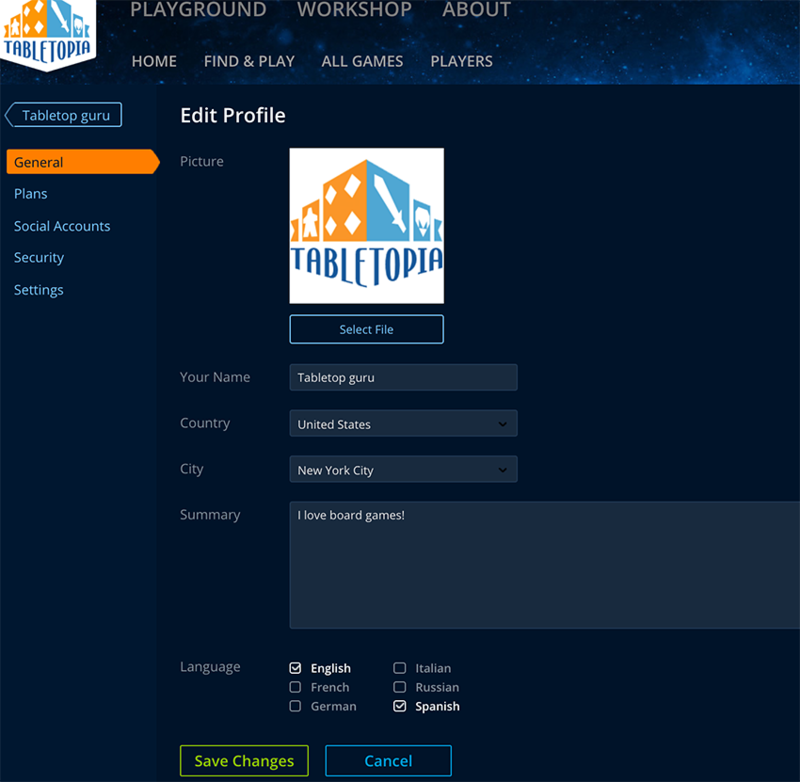 Your profile on Tabletopia is a place where your personal information, player statistics, bookmarked games, social accounts and current pledges and plans are displayed. *These features are available in browser version only. If you play on Steam, you can access the browser version by logging in with Steam credentials, read more: Activating Steam Account. Filling out your profile and adding your image, spoken languages, location, and other details will help us make your experience with Tabletopia more personalized and enjoyable. Go to www.tabletopia.com or launch Tabltopia on Steam. Click your image in the top right corner of the screen > Profile or click your user name in the menu bar in Steam client. Click Edit Profile > General. Fill out your profile by adding your image, name, email, country, city, spoken languages, and some information about yourself in the Summary field. You can set up your game invitations filters and subscribe to our newsletter in your profile. Go to www.tabletopia.com or launch Tabletopia on Steam. Click Edit Profile > Communication. To change your invitations permission, select All Players, Only Friends, or Nobody in the Notifications drop-down menu. To subscribe to Tabletopia newsletter, select the respective option. Available in browser version only. If you play on Steam, you can access the browser version by logging in with Steam credentials, read more: Activating Steam Account. Click your image in the top right corner of the screen > Profile. To see details of each of your plans, hover the cursor over the “?” next to the plan name. You will get full information on the features you have now for both player and designer plans. See more about plans in Tabletopia Pricing: In-Apps and Plans. 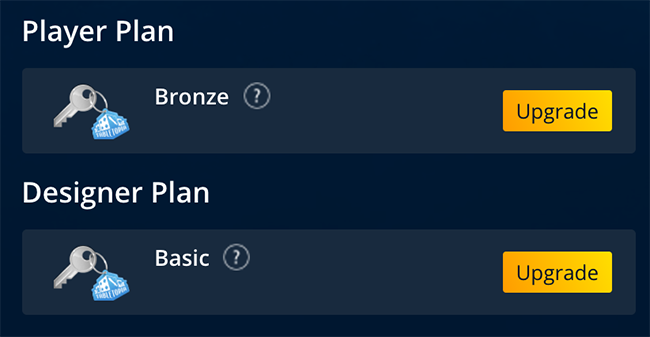 Click Upgrade next to the plan you wish to upgrade. 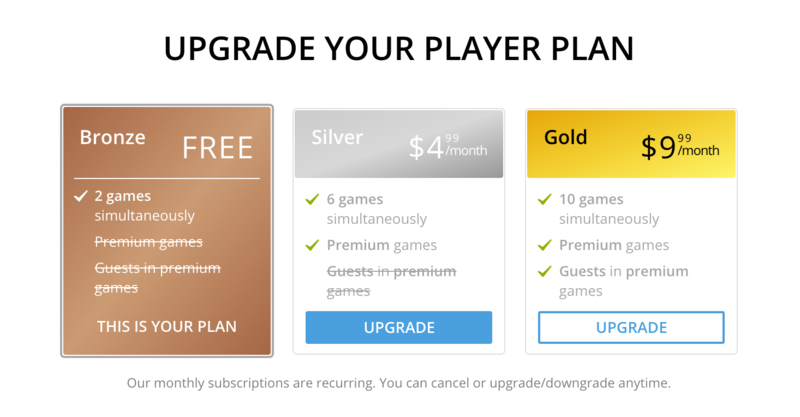 Select a new plan > Upgrade and proceed with your payment to activate the plan. You can connect your Facebook, Twitter, Google+, or Steam accounts to your Tabletopia account. 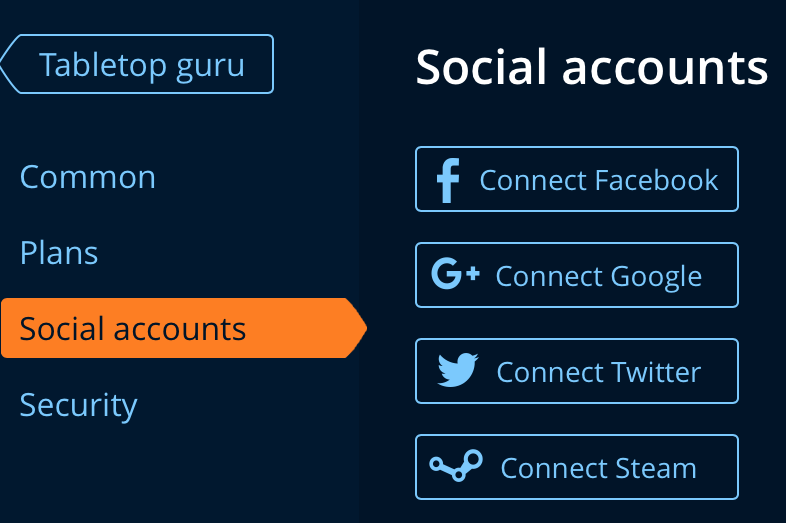 Click Edit Profile > Social Accounts. Click the account you want to add. You will be redirected to the selected network to proceed with adding your account. Click Edit Profile > Security. Enter the old and new passwords > Change Password.